Disposable, single-use metal blades, ophthalmic straight knives with blue handles. Handle has smooth, single handed blade retraction and has ergonomic design. Blades have superior sharpness and are available in various angles and are double bevel. Packaged individually, sterile. Sold 6 per box. 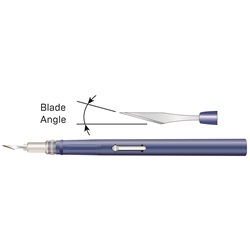 22.5-degree angled blade, double bevel. 15-degree angled blade, double bevel.